Our home is a bungalow with cathedral ceilings. It is spacious and sparkling clean. Our home is #655 at Venture Out Resort on Cudjoe Key. (A 24-hour gated community). We have a light and bright two bedroom, one bath cottage which is a tropical paradise. We have wood floors and tropical decor. The roomy living room has a TV with expanded cable, DVD, comfy new sofa (which can also sleep 2 people) & a comfy chair. Each room is light and bright and always sparkling clean. Our home is obviously equipped with a/c to keep you comfortable & cool. We have WIFI in our home so you can remain 'connected' to the world while enjoying paradise! Adjacent to the living room is the large eat in kitchen which has updated cabinets, counters and new appliances. There is an adjacent dining room table. People always end up in the kitchen! There's lots of light and new larger windows so it's a great place to be! 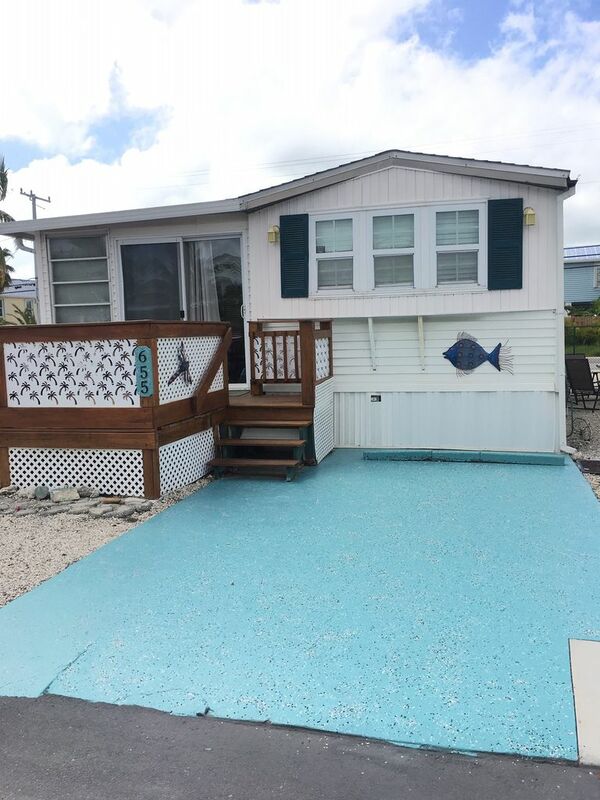 Fully stocked with everything you'd be looking for on vacation including dishes, wine glasses, all the pots and pans you need, coffee maker, keurig, blender, toaster and MORE. The master bedroom has a KING size bed with new comforter, lots of storage space and cable TV. We're provided lots of fluffy new cotton towels in the bathroom. The second bedroom has a twin trundle, when the two twin beds are side by side it's like another King Size Bed and cable TV which is video game ready. We have a grill in our backyard along with cement patio furniture for you to enjoy the beautiful keys weather. The front porch has a large deck, seating for 4 but there's 2 more folding chairs in the cabinet. You can enjoy the sunrise and your morning coffee, family dinners and evening cocktails! Bring your boat! We are on a dry lot but there is no charge for launching in at the Venture Out Marina, your boat can be stored in the 'overflow' lot for a small fee ($5-10 day if you reserve in advance through the resort ). The Florida Keys have some of the best fishing in the world! (Boat and trailer parking is an additional daily charge by the park.) It is also a great spot for Kayaks. You can swim or fish from our open water areas. There is a big TIKI HUT on the open water where picnicking is perfect! PETS are allowed. An nonrefundable pet fee of $50 will be charged to cover the additional cleaning costs. The park does have pet rules which are part of the rental agreement. Our home is always sparkling clean! OUR HOME IS NO SMOKING. Smoking outside is obviously permitted. The GATED COMMUNITY we own in is AWESOME & a very friendly place to stay & enjoy. The resort amenities include: 24 hour security, Lighted tennis courts, Olympic-sized heated pool, kiddie pool, spa Jacuzzi, ping pong, bocce ball courts, shuffleboard courts, golf putting area, lighted basketball court, children's playground, pool table, darts, Marina complete with 2 ramps, gas, store, ATM and fish cleaning station, boat trailer parking onsite, open water picnic areas, ocean front tiki hut, lending library, post office - and MORE - ALL IN A GATED COMMUNITY with a mixture of RV sites and manufactured homes where you can feel safe and secure. We're only 19 miles from Key West, but do not think you HAVE to go anywhere - lay by the HUGE POOL right on the OPEN WATER and watch the elegant seagulls float overhead as the palms sway. Sun yourself and read a good book and simply relax! Plunge into the BIG JACUZZI and soak your troubles away. Or spend some time with someone you love - holding hands and watching the herons fishing along the waterside! And you do not even have to get in your car to do any of these! What are You waiting for??? Send an email and we'll fill you in on any of your questions to make certain your family and friends are going to have a great vacation getaway in the Keys! Make sure you check our availability calendar as it is updated after each reservation is placed. Plan it now, before someone else gets YOUR Place! I've been vising the keys for years. In 2010 while on vacation I stumbled across this property and suddenly now own a little piece of the Keys paradise! I chose to buy in the Keys as it's a beautiful relaxing location! I live in Massachusetts and LOVE to escape to the Keys! Key West is only 19 miles away so my property is a great location, you can relax here or travel for some excitement. There are some great places close by to eat, The Square Grouper, The Wharf Grill, Bookdocks, Mangrove Mama's....most look like holes in the wall that you'd never enter at home but they're great. It's all part of the unique beauty of the Keys! it is across the street, but there is a home there but you can see a little of the water!!!! Loved our trip to the keys. Such a cute place for us to enjoy our time exploring over thanksgiving. The place was clean and the pool and surrounding facilities were nice. Not far from key west. We had a great time. No afternoon naps because it was cooler in the shade outside and with a breeze than inside. I'm sure this place is lovely during the winter but summer forget it. Called and emailed about the situation there just wasn't a solution?? Management came said nothing could be done. So we dealt with it. Clean nicely decorated and convenient. Already have booked my next stay. Our rental was very clean, well equipped and newly decorated. The location was perfect when driving to the other Keys both North and South. It’s also in close proximity to several very good restaurants. There is a fee due at the time of entrance that is payable to the resort. It is a $53.75 fee payable via cash or check at the time of entrance. This is in addition to the figures above. $100 Surcharge during Holidays and Lobster Season and rate is peak season rate. Also minimum one week stay during these times.